Fishermen are going to organize a mass protest with gathering thousands of fishermen together against the present government in the country. Fishermen are accusing the government that they are not allowed to fish when those heads of the government flies over the lagoon to foreign countries. Fishermen are suggesting to the government to create some red light as a signal to infor fishermen not to go to the lagoon on those days for fishing if such a things happening any further to. If they have requested this from the responsible authorities, the authorities are not ready to listen them as they are marginal groups in the country. In last November some of fishermen were assaulted in Negombo lagoon and see the story here by clicking on this link. Their main target of this protest is to drew an attention from authorities on the issues of stop illegal fishing practices in the sea and they need an alternative for fishing in the lagoon without facing such a difficulties when fishing. 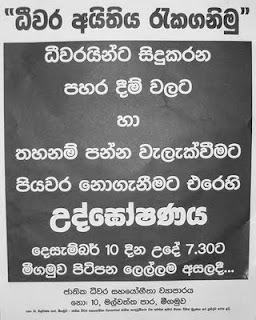 This protest will be organized by NAFSO Negombo partner organization Sri vimukthi Fisher Women’s Organization, and will be launched on 10 December at Pitipana fish market Negombo @ 8 A: M.